Birralee is a large and active Scout Group in the suburb of Gungahlin in Canberra’s North. Currently the Cub and Scout sections are full and there is at least a 12 month wait to join these sections. We have a small waiting list for Joeys. If you would like your child’s name to be included on this please contact Jemalong – the Group Leader. Venturers are always open to new members. While we welcome new members we currently are full in the Cub & Scout Sections. The waiting list for these sections has also closed due to the large number still waiting for a place. 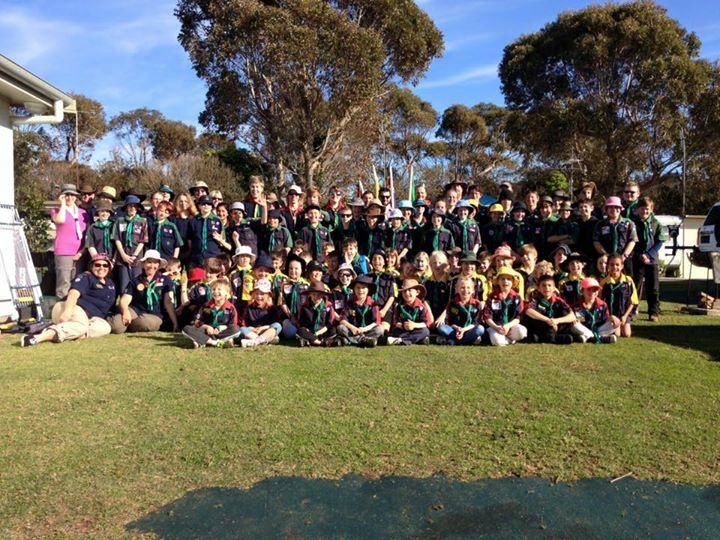 At South Durras Birralee Scout Group had a Group Camp. 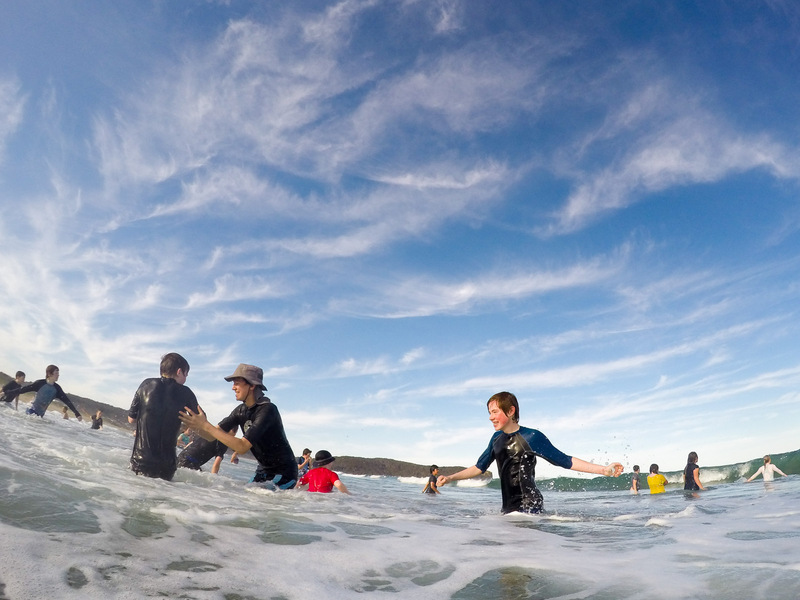 At camp we did all different activities and the one I did was beach sports and it was really fun because we had finished all the games and there was still 10 minutes left until we had to head back to camp so we got to play in the water for 10 minutes. We also saw a pod of dolphins and I think I saw a small fin in the water. We also went on a hike through the bush and some people got leaches. When we were near the end we got to take our shoes off and dip our feet in the water. My name is Brooke and I am a Cub in Yowie Pack at Birralee Scout Group. On September 11th/12th/13th I went on my first group camp since becoming a Cub in May this year. It was awesome. 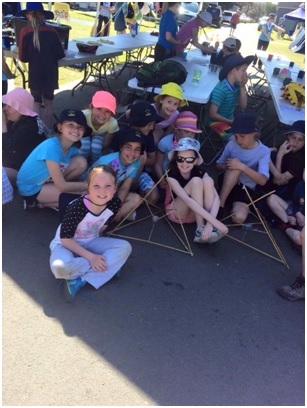 On day 2 all the Birralee leaders had fun activities that we chose to do. My activity was camp cooking. It was really cool. We made scones, apple cake and cinnamon muffins (in orange peel cups) and we even cooked them over a fire. After our morning activities we went on a huge hike. A few of the kids in our group got leach bites, thankfully not too bad and it wasn’t me. We stopped for lunch near a lake and had a rest until it was time to head back to camp. On the way back we went to the beach to collect shells/seaweed for our next activity. When we got back from the beach we had afternoon tea and got ready for our afternoon activities. Using the things we collected from the beach we made natural artworks by gluing all our treasures onto pieces of wood. They looked fabulous. After some free time it was time for delicious dinner of burgers. 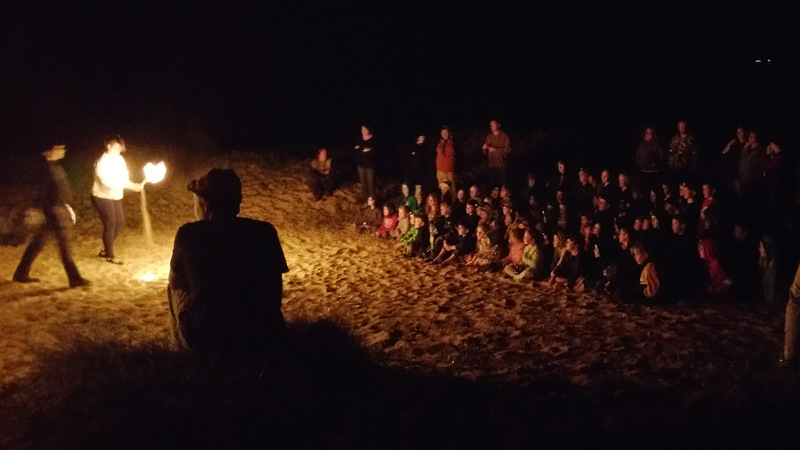 We were then treated to an amazing surprise down at the beach. The Venturers and Rovers put on a show of fire throwing for us all. The funniest part was when Will (one of the Venturers) accidently caught on fire and he didn’t even know. He was fine and everyone thought it was hilarious. After the show we headed back to camp and played a few games which was really fun. Then supper and bed time. Not too much chatting in bed this time as we were all exhausted and very tired. On the 3rd and final day we spent the morning (after eating delicious French toast for breakfast) doing activities with just the Cubs. We made our own woggles out of Blue and Green beads, so they match our Birralee scarfs. After our craft activity we helped pack down out tent and then headed to the beach again for some more fun. 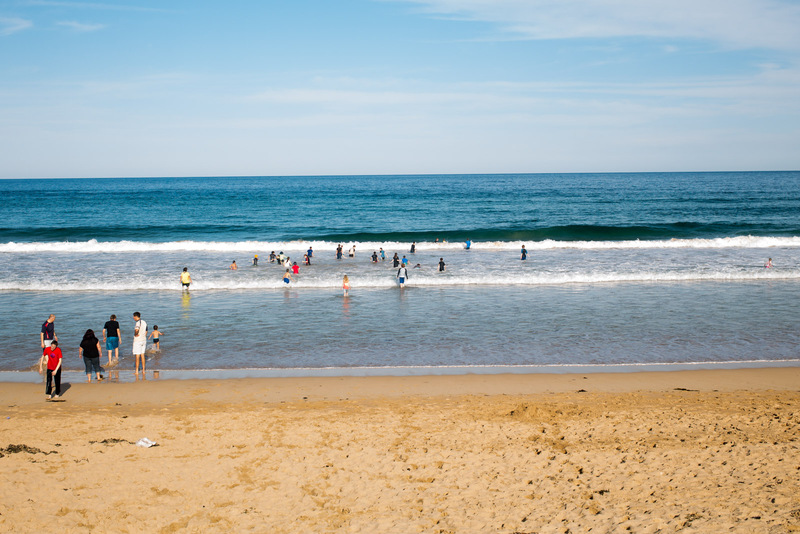 We had the choice of playing in the sand or playing in the waves. I had great fun in the sand digging holes and playing with my friends. After a great time at the beach it was time to head back to camp for lunch. After a little bit more free time it was sadly time for our group camp to end. I had the best time and can’t wait for next year. My name is Ashley. I am a Joey at Birralee and I went on my first group camp to the beach at South Durras. I loved it so much. We got to go to the beach and we collected stuff on the beach to make sand glitter globes. Mine had shells, seaweed, cuttlefish and some toy fish. We also made dream catchers out of paper plates, wool, feathers and beads. It is really cool. We went on a really big walk in the bush. I got a leech on my ankle. My leader Kanga said I was very brave. The Joeys also got to get a lift back from our bush walk with the Venturers in a canoe, that was much better than walking. I played frisbee on the beach and I was really good at catching it and throwing it. The Rovers and Venturers did some fire throwing at night which we all thought was really cool. I can’t wait until I’m a Cub and I get to sleep in a tent with my friends. S couts from Girrawah Troop and Gungaderra Troop participated in a joint Landcare tree planting day with Scouts from 1st Murrumbateman, planting over 250 trees to provide food and shelter for native species. 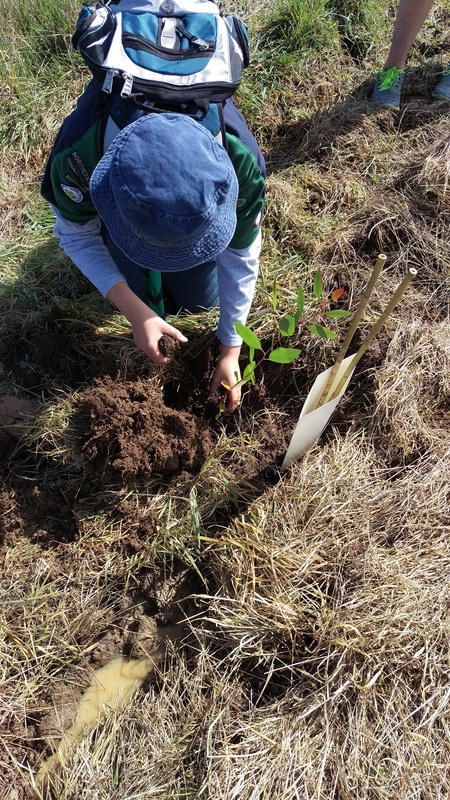 On Sunday 30 August, Scouts from the three Troops traveled to a farm north of Murrumbateman and planted native trees and shrubs along a number of ‘corridors’. Once grown, these will link existing pockets of vegetation and allow native species to more easily move through the area. Under the guidance of a local Landcare group, the Scouts dug holes, planted trees, and installed protective barriers. The 250 trees and shrubs were planted in just under an hour and a half. August is Scouts in Action Month, which this year focuses on getting Scouts to experience and connect with the natural world. Patrol Leaders taking the first fundraising shift. As part of their Citizenship badge, Birralee Scouts from the Girrawah Troop sold Daffodil Day merchandise at The Marketplace Gungahlin to support the Cancer Council ACT. 12 Scouts manned the fundraising stand outside Coles for two hours, selling merchandise and collecting donations. Over $150 was raised despite the wet weather keeping the shopping crowds away. All money was donated to the Cancer Council ACT to help fund cancer research and patient support. Many thanks to The Marketplace Gungahlin for allowing us to use their site. 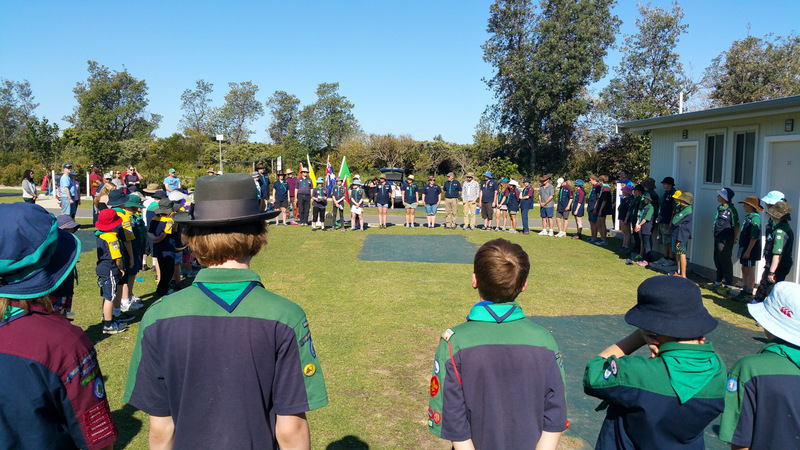 Girrawah Troop meets on Monday nights 7-9pm at the Birralee Scout Hall (5 The Valley Avenue, Gungahlin), and is open to boys and girls 11 to 15 years of age.